Interested candidates may appear at the venue by 9AM. 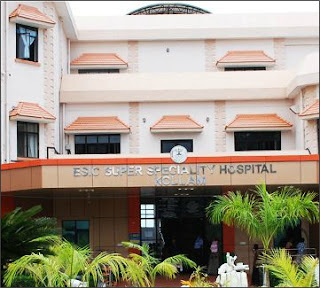 ESIC Model & Super Specialty Hospital, Asramam, Kollam is situated on beautiful banks of picturesque Asthamudi Lake on a plot measuring about 3.89 acres. The Hospital was commissioned in the year 1968 having 150 beds and was meant for imparting services to 12 dispensaries located in and around Asramam having about one lakh I-P population, major chunk of whom is women employees working in cashew processing units. The hospital was one of the biggest in Kerala and had outpatient and inpatient treatment services in allopathic and homoeopathy systems of medicine. It was decided to construct a new block in order to start super speciality services in the hospital. The foundation stone for Super Speciality Block was laid on August 9th 1997 by the then Hon'ble. Union Minister of State for Labour Shri M.P. Veerendra Kumar. In order to improve the medical facilities ESI Corporation decided to take up one hospital in each state to run it as a Model Hospital. It was also decided that the entire expenditure on model hospital shall be borne by ESI Corporation directly without any reduction in the funds allotted to the state to run ESI Scheme. ESI Hospital Asramam was taken over on 01.01.03 to run it as a Model Hospital having Super Speciality Services.